The original inhabitants of Urunga and the Bellinger Valley were members of the Gumbaynggirr Aboriginal tribe. For thousands of years before European settlement this tribe had occupied part of the New South Wales North Coast, in an area which spread from what is now South Grafton out to Wooli on the coast, to as far as Ebor in the west and down to Macksville in the south. The tribe was composed of several clans or kinship groups and had no powerful rulers in day-to-day life. Spiritual and ceremonial matters were guided by the elders in each clan, who were also the guardians of the Dreamtime traditions, while sorcerers claimed the power to heal and to kill, using sacred stones or crystals passed down through the generations. 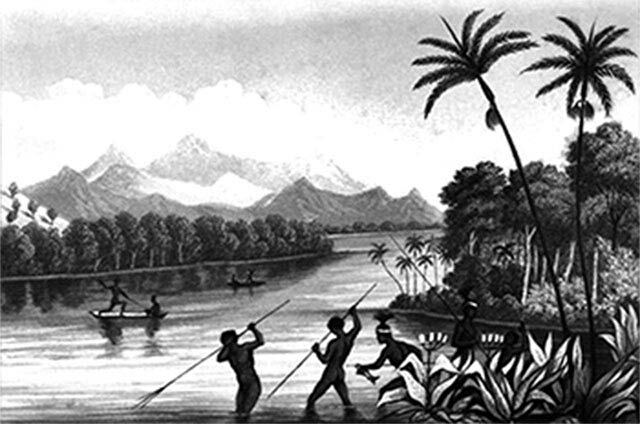 Hodgkinson’s “Aboriginals spearing fish on the Bellinger” from his 1845 book. This Aboriginal society was first documented by Clement Hodgkinson, a government surveyor who explored the area in 1841 and 1842. (Some of his illustrations are shown below.) European timber cutters arrived in the Urunga area in 1843 and the Aborigines’ self-sufficient, nomadic way of life was overwhelmed by European settlement. An Aboriginal Reserve was set up on The Island (now known as Urunga Island) opposite Mylestom in 1892. After a flood in 1921 it was moved to nearby Yellow Rock on the mainland and by 1937 most of the Urunga Aborigines had been moved to Kempsey by the Government.